Evolis Zenius ID Card Printer Membership cards in Melbourne. The Evolis Zenius ID Card Printer, Zenius is one of the fastest card printers in the market, and this next generation printer matches top-of-the-range performances with higher image resolution. Used for making PVC photo ID badge cards as well as school student cards, loyalty applications and security access control cards. Works on BOTH Windows & Apple MAC. 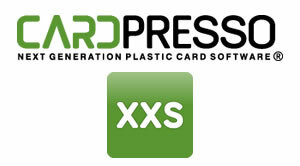 Together with Cardpresso makes for a complete ID card printing solution. Plastic Badge maker ID card printing system. 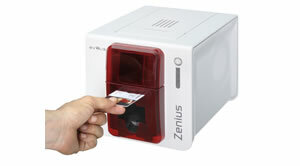 The Evolis Zenius ID card printer is designed for single sided printing and encoding plastic cards. 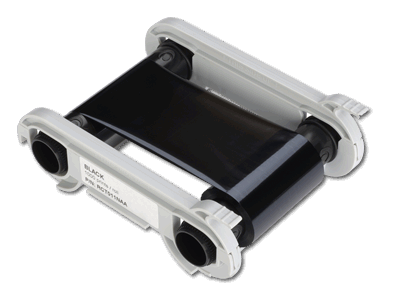 The card printer produces colour and monochrome cards ensuring your logos, photos, barcodes and text are printed correctly. 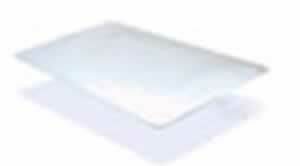 reduces the power consumption of its card printers (ErP Directive 2009) through a very economical hibernation mode. World class leaders in the field of ID Badge Card Printers, Evolis Card Printers have been acknowledged as pioneers in desktop card printing. Supplying Banking, Security, Education and many other card related industries. Zenius, is available in classic (USB only) and Expert (with Ethernet & can be upgraded with card encoding options) editions. 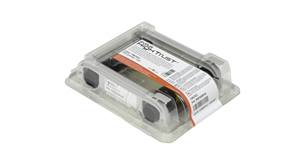 Works with Windows 10 and Apple Mac. Colour ribbon, prints 200 prints per roll. 50 Blank White PVC Cards, supplied with the printer. Card design software, Primacy printer is supplied with Cardpresso XXS version. The Zenius membership ID card printer proudly carry the stamp of Evolis’ strong commitment to reliability, and therefore, benefits from unmatched quality along with a 2 year warranty. Print PVC Plastic Membership cards on demand.